At 7 p.m. Wednesday, the South Park Bridge’s draw spans will open for a last time and stay that way until the entire structure is soon demolished. The 78-year-old bridge has reached its useful life and will be permanently closed for safety reasons, cutting off a vital transportation link across the Duwamish River — 20,000 vehicles cross it every day — and further isolating a neighborhood that locals say has always been forgotten. Today the State of Washington announced additional funding for a new bridge, but it may still take years until one is in place. “We know that it’s going to take approximately two-and-a-half years to build … best possible scenario is three years without the bridge,” said Bill Pease, a 10-year South Park resident and member of the South Park Bridge Committee, a neighborhood group that has been lobbying for funding for a new bridge for six years. 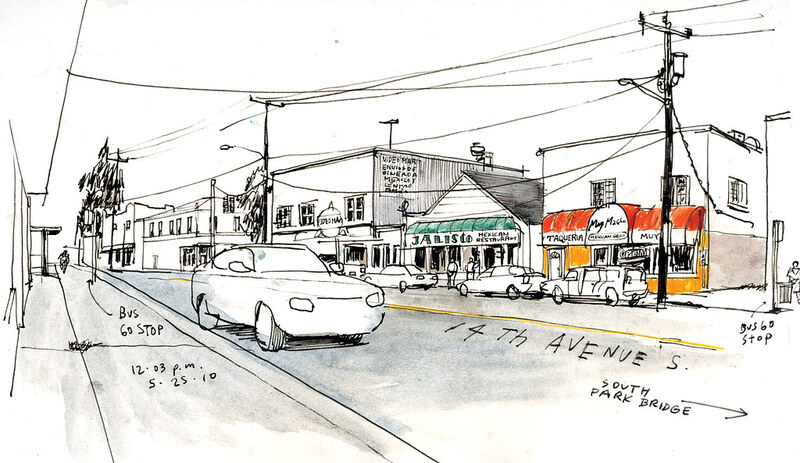 When I recently walked, drove and drew around the area, I discovered a close-knit community that I enjoyed for its small-town feel and diversity. Here I could put my Spanish to use at the stores and join in the morning chat at the caf&eacute or the bus stop. While the bridge’s poor condition is no suprise to most people –it sustained serious damage during the 2001 Nisqually earthquake– the neighbors and business owners I talked to along 14th Avenue South were shocked and angered the bridge will close before it can be replaced. They said the street will be a road to nowhere after the bridge closes, a ghost town. Over the next few days, I will share the stories I came across sketching near the bridge. The sketches were done in South Park on May 19 and 25, and June 8. You’ll also find some of the sketches and stories in Sunday’s printed edition.